Exceedingly steadfast against the breath of the enemies of God. Eustathios the divine Confessor lived during the reign of the first Christian emperor Constantine the Great (306-337). He was from Side in Pamphylia, as Jerome says in his "On Ecclesiastical Writers". Niketas says he was from Philippi in Macedonia. This Saint was a teacher, and sent by the wisdom of his words the rays of Orthodoxy throughout the ecumene. He was also present at the First Ecumenical Synod of Nicaea, which gathered in 325, keeping the dogma of piety and Orthodoxy, while rebuking and overturning the Arians. These mindless ones had introduced a cutting and division into the one nature of the Holy Trinity, calling the Son of God a creature, and dividing Him from the essence and honor and worthiness with His consubstantial Father. 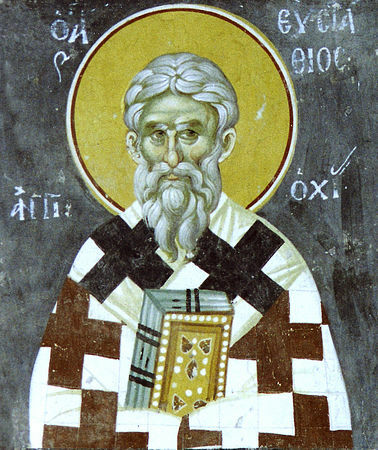 Therefore through his divinely-inspired boldness, and through the zeal he had on behalf of the Orthodox faith, Eusebius of Nicomedia and Theognis of Nicaea and Eusebius of Caesarea, together with all those who were in communion with the Arian blasphemy, or we should say unbelief, slandered him. Thus under the pretense of going to Jerusalem, they went to Antioch, and gathered an assembly to depose the Saint. To make it appear as if they deposed him for a sensible reason, what did the cunning ones fabricate? They gave large gifts to a prostitute who had a newborn child, and they persuaded her to speak falsehood, saying that she conceived the child with the Saint. Therefore the prostitute came to the assembly with that child, and she slandered the Saint saying that by him did she receive and conceive the child. Those treacherous Hierarchs sought no other testimony, but only gave the oath to the woman and this was enough for them, so they immediately crafted the deposition of the Saint. And not only this, but they persuaded the emperor (namely Constantine the Great) to exile the Saint. Thus the blessed Eustathios went to Philippi through Thrace, and there his life came to an end. 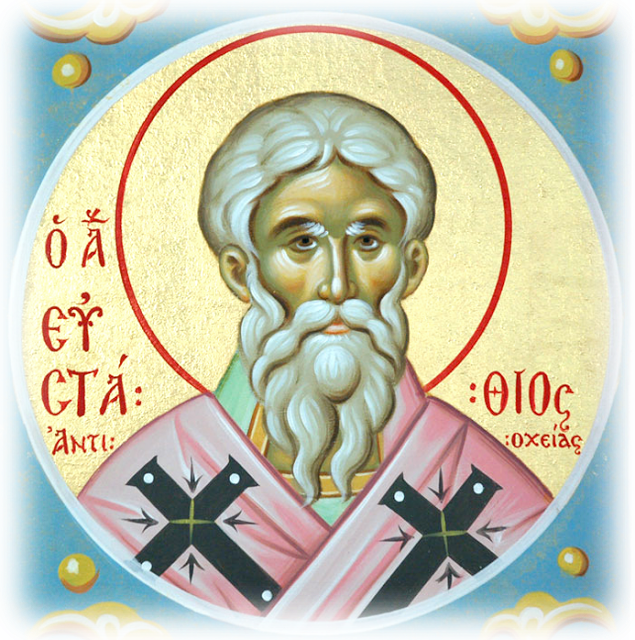 * Before becoming Archbishop of Antioch he was the Bishop of Beroea (Aleppo) in Syria. At the First Ecumenical Synod he was elevated to Archbishop of Antioch. At the Synod of Antioch which deposed him, he was also accused of being a Sabellian. Upon his exile, he went to Traianopolis in Thrace in either 329 or 330. His deposition caused a schism in the Church of Antioch that was not healed until 414. Thirty years after his exile, in 360, he reposed in peace. John Chrysostom calls him a "Martyr", while Michael Syngellos (ca. 761-846) calls him "the foremost of the Fathers of Nicaea." Thou didst shine like a brilliant sun in the First Synod, O righteous Eustathios, for thou didst proclaim the Son to be of one Essence with the Father and with the Spirit. Pray, O Hierarch of God, that unwavering steadfastness in the Faith be granted to all who honour thee. Thou didst purify thyself with godly works, and become a pillar of the priesthood in divine vision and a blameless life. Thou didst withstand the onslaughts of temptations as a foundation and bulwark of the Church. And so we cry: Rejoice, O Father Eustathios.